Even though Apple didn’t introduce the widely rumoured sapphire displays with its latest iPhone 6 / 6 Plus smartphones, it seems that the company is hard at work on bringing such a solution in the near future as evident from a new Apple patent published by the U.S. Patent and Trademark Office, that describes the method of attaching sapphire cover glass to iPhone, AppleInsider reports. Titled “Ceramic cover for electronic device housing”, the patent describes use of either sapphire or zirconia, both in crystalline form to achieve suitable transparency levels. 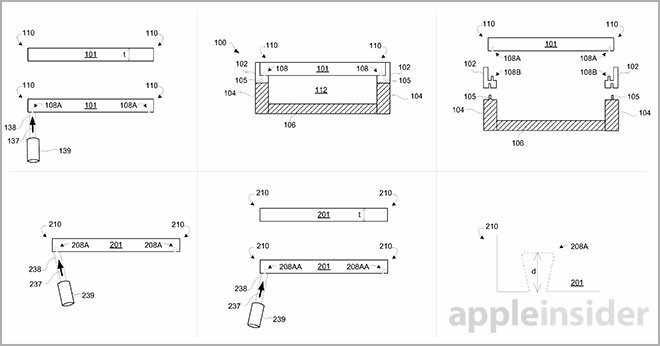 Apple explains in detail the method of fitting the ceramic cover housing onto a handset, suggesting that instead of using adhesives that add extra thickness to the overall build, “an attachment member much like mortise and tenon joints” may be used. “In one embodiment, a laser ablation technique is used to carve out recesses in a sapphire sheet specified at between 0.3 millimeters and 1.0 millimeter in thickness. A jet of fluid helps to cool the material and carry away ablated ceramic that might resettle into a freshly cut recess. Attaching the sapphire to a device housing involves Apple’s usual shock-resistant thermoplastic peripheral side members, the thin black buffer zone seen on all iPhone and iPad models. The sapphire iPhone cover patent application was first filed for by Apple in May 2013.